It's going to be so strange seeing our national players compete against each other at international level. Unnatural. I'll have to pick a team soon. I have family in Kolkata and Mumbai, so one of those would the obvious pick, but on the other hand I could choose depending on where my favourite players are going. Ponting is going to Kolkata but my Andrew is going to Hyderabad. I guess there's a few points there for Kolkata. At a meeting the BCCI made a commitment that players' international obligations would take precedence over IPL matches. In return, the ICC said that while the Future Tours Program was in place (until at least 2012) no window for the IPL season would be considered. Now that's compromise for you. Jaipur are going to be penalised for not spending enough at the auction. Apparently each team was supposed to spend a minimum of $3.3 million. My goodness, I thought salary caps worked the other way around with a limit to the spending. Apparently they're going to spend more money outside of the pool. Righto. Brett Lee has proclaimed this auction to be a defining moment for the future of cricket. "It's a bit like when the World Series started - providing we always keep Test cricket as Test cricket, one-day cricket as one-day cricket and keep this (Twenty20) as the third form of the game." Certainly, Brett. I think he is correct though, if this IPL takes off these past few days will prove to be historic. And I think he's right that Twenty20 needs to stay in third place on the priority list. As long as the players remember this and continue to believe it, I think the IPL and cricket as we know it should be able to function adequately simultaneously. Alastair Cook, who I've heard has a penchant for eyeliner, had this to say about it all... "We're very well looked after and I can't see why you'd trade in the three lions for anything." As an Australian who sees a permanently drowning side struggle through its embarrassing existence, I must say, he's a funny boy. Andrew Flintoff, who gained my pity-turned-respect after the 2006 Ashes, was a bit more articulate. "Lancashire and the ECB have looked after me well and my concern is to get on the field for them." That's loyalty, not blind subservience. Flintoff played his first game yesterday with the England A side. For competition's sake, I hope he gets back on track and does well. From a spectator's point of view, he's a good player to watch. As long as he's not too good. Just you remember that, Freddie. Back to India. 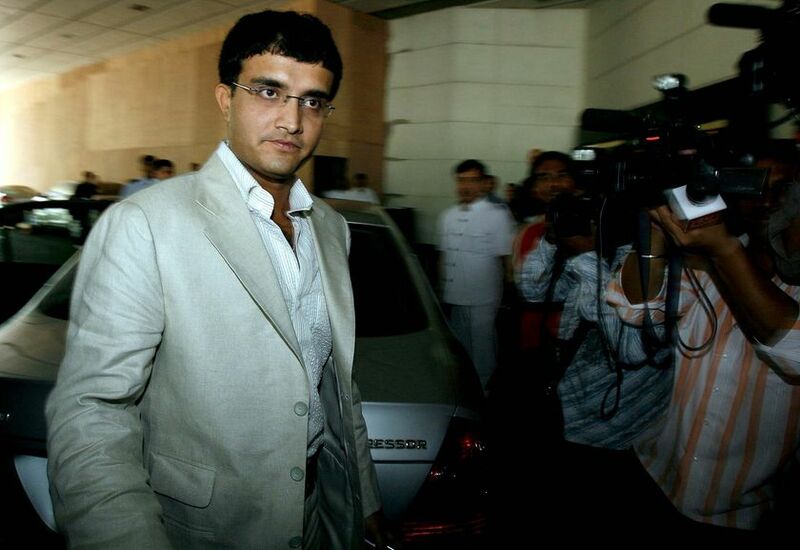 The ABC have a photo of Sourav Ganguly arriving for the auction looking rather sharp. And on pictures, this man owns the Kolkata franchise, and is a big star apparently. The photo made me smile. His hair is almost as fabulous as her jacket. I can only aspire to be so fashionable. EDIT: I just noticed in that photograph of Sourav that it looks like he's just stepped out of a Mercedes Benz Kompressor. Nice work if you can get it! The Kolkata Kall Kentre employees for me. Please tell me the rest of us don't have to pick a favourite team.. I can't stand it when I see 5 year-old kids wearing Man U kits in shopping malls; I really hope we aren't infested by this as well. Haha I never thought of it like that but you make a good point. Maybe I'd be able to relate to the Man U thing if I liked soccer, but I can't stand the game. Bleurgh. I feel compelled to support a team, I couldn't tell you why. go on flip a coin. Good to see you Chinaman. Well what are the odds of a coin landing on its side?! It's a sign. Nah. It's Calcutta. I follow my captain. Yeah, I agree, Kolkata! I follow hot young Indian bowlers! Well we're both Kolkata supporters now it would seem... funny how these things fall into place. I've decided it's all going to be shite, and within two years every one will be bored with it. It's like a rubbish version of fantasy cricket. This ranks up there in my "do i give a f*ck" lists, about as highly as the Stanford 20/20..
Davo - even in fiction England are crap. Marvelous! Actually the poms all love the three lions too much. Which is both admirable and sooky. I think they're just committed elsewhere and disguise that with "Oh no money could buy me!" Chinaman - Aw, of course you do. Kolkata is da team!